This question was echoed by several people. So, I decided to write a blog about the process of drawing wire. They didn’t understood the concept, how you would do it, or why you would do it – I can fix that! Today we can purchase wire in any size that we want. Craftspeople often just buy the size of wire that they need because it’s easy and convenient. But once in a while you may find yourself in a position of needing to finish a piece of jewelry and you simply don’t have the correct size of wire – but you have a larger size. BUT FIRST: There’s no more important rule than to wear safety equipment including glasses when drawing wire. It does take a little muscle, and some tools. The process is not too difficult, but it takes some skill and knowledge. Most wire is sold “half hard”, which means that it is not super soft, but it is still very flexible. We exploit this fact during the drawing process. The two most important specialty tools that you will need are a draw plate and draw tongs. 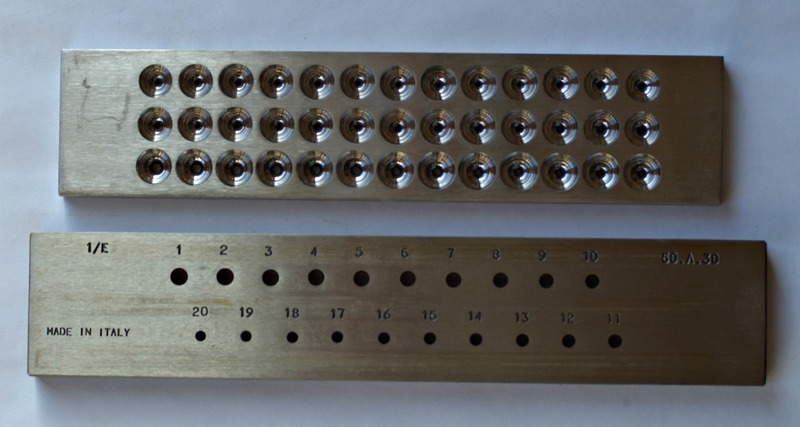 A draw plate is simply a piece of tool steel that has holes of progressively smaller sizes drilled in it. The sides of the holes on one side of the drawer plate are often tapered to make the process easier and eliminate marks on the wire. This picture shows two different styles of draw plate. The bottom plate simply has holes drilled through it, while the other has a regular hole on one side and a tapered hole on the other side. The wire is put through the draw plate from the tapered side of the hole. Draw tongs are not a necessity, but they definitely make the process a lot easier. 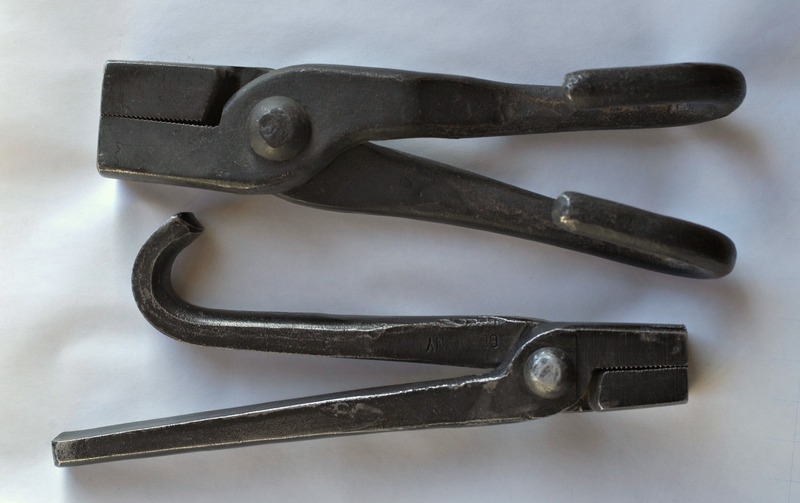 They are large, heavy, sturdy pliers, often with a hook on one or both of the handles. This hook allows you to have a better grip on the pliers so that you can pull the metal through the draw plate more easily. The following picture shows both common styles of draw tongs. So how do we actually draw down a piece of wire? The process starts by using a file to taper the end of the wire. Tapering the wire is essential so that it will go through the hole in the draw plate and extend at least ½ inch on the other side. Having a decent sized piece of wire to grab with the tongs is very important. A shorter piece will sometimes slip out of the tongs or break off. The draw plate should be securely anchored in a vise before you try to draw down the wire. Make certain that the vise is held down securely. Start with a hole just slightly smaller than the wire diameter. Put the tapered wire through the draw plate, grab it with the tongs and pull! Be careful to watch out for the end of the wire. When the end of the piece of wire comes through the draw plate it usually does so suddenly, and a flying piece of wire can be dangerous. Wear safety glasses! Personally, I had very little experience with drawing wire apart from the occasional need for a smaller diameter than I had on hand. That all changed when I needed wire to be harder for a specific project. And that brings us to another reason why you might draw down wire. I now make several things for my shop that require the wire to be springy and fairly hard. You can harden wire by hammering it, but for large quantities of wire, the easiest way to harden it is by drawing it down. Every time you draw the wire down it will become harder and springier, and more difficult to pull through the draw plate. Repeated trips through a draw plate using smaller holes is hard work. It’s amazing how much effort each pull requires. This is a skill that can be learned, but it takes practice – and sweat! The entire process makes me really appreciate how easy modern artisans have it in comparison to artisans living hundreds of years ago. Imagine having to draw ALL of your wire!! !